Oct 22, Oct 25th, Nov 2nd! We Are Standing with Those Who Stand for Humanity and the Planet! If you are on Facebook, please join here and invite friends. If you’re someone who’s fed up with being jacked up, harassed, beaten down, arrested, and worse by the cops, you need to act on O22! If your eyes were opened to this abuse by the verdict in the Trayvon Martin case, you need to act on O22! 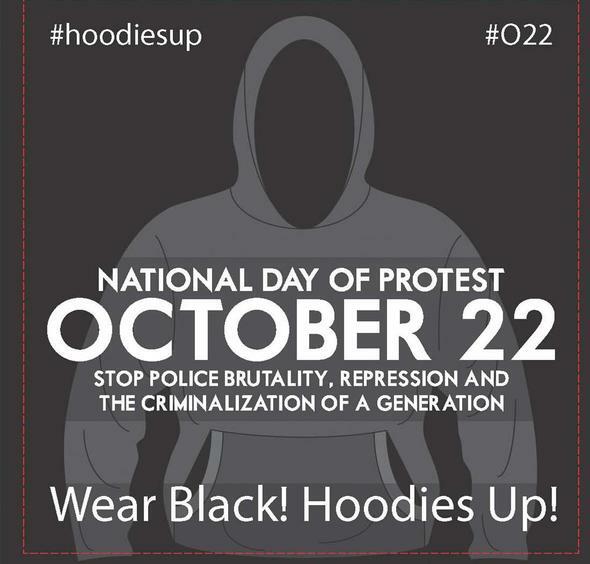 If you’re one of the actors, musicians, and other well-known people who tweeted “No Justice, No Peace!” when that Zimmerman verdict came down – well, we haven’t gotten justice, so you need to act on O22! High school students and teachers need to mobilize their schools on O22! College students and faculty members need to mobilize their campuses to act on O22! Religious leaders need to address this injustice in their sermons, and lead their congregations to take to the streets on O22! STOP POLICE BRUTALITY, REPRESSION AND THE CRIMINALIZATION OF A GENERATION! NO MORE STOLEN LIVES! HOODIES UP! WEAR BLACK, FIGHT BACK! Here in Chicago, we are in the middle of a major part of the tar sands pipeline network that is expanding throughout North America. In fact, the British Petroleum refinery in Whiting, IN, (just minutes from Chicago) will be the largest inland refinery for toxic tar sands sludge in the country. Its pet coke wastes are already piling up on the Southeast Side. Last summer, several people working with MICATS (Michigan Coalition against Tar Sands) chained themselves to equipment being used to expand the Enbridge 6B pipeline along the eastern side of Lake Michigan to interrupt the project. Three years ago, the 6B spilled over a million gallons of tar sands into the Kalamazoo River, creating the largest inland oil spill in US history. 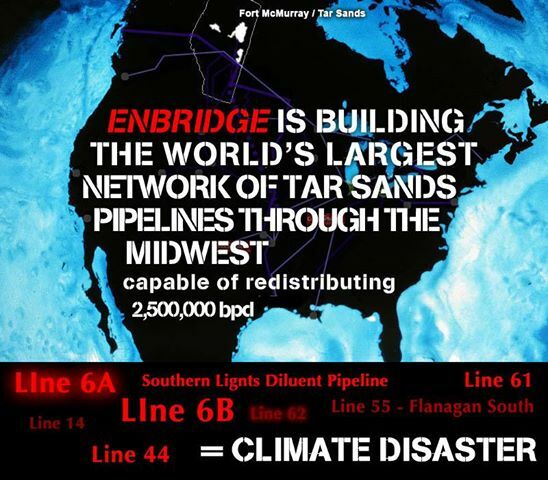 Enbridge has failed to clean up that spill, and now, under the guise of rebuilding, they are in the process of doubling the size of the 6B. With their action, MICATS hopes to draw attention to this imminent danger and contribute to a broader movement to stop tar sands. MICATS needs to raise $10,000 to cover their legal costs. Come to this party and lend a hand – Humanity and the Planet Come First! FREE and reduced cost ($10) bus tickets are still available for the big Oct. 22nd March on Springfield for Marriage Equality! Thanks to the generosity of our donors, free seats are still available for buses leaving from Rogers Park (in front of Touche, 6412 N. Clark), The Center on Halsted, (3649 N. Halsted Street), Pilsen (outside the 18th Street Pink Line el stop) and Chatham (at the Hardtimes Restaurant, 436 E. 79th Street). Tickets are first-come, first-served while they last, so get yours today! To get reduced price (or full price) tickets, go to www.gayliberation.net For free tickets, email LGBTliberation@aol.com with your name, phone number and location that you would like to depart from. Don’t miss this important day in LGBT history! News About Our Friend Gregory Koger! After a four-year battle against a truly vindictive prosecution, our friend Gregory Koger will finally be out of the clutches of the Cook County system of criminal injustice. He and his defense committee and friends fought tirelessly against a prosecution for the “crime” of taping a statement against censorship at the “Ethical” Humanist Society of Chicago. Hard to believe? Read the details & watch the video he took that day here. Now, let’s celebrate the fact that Gregory has served the outrageous sentence he was given and he will now be with us again contributing to the fight to liberate humanity and the planet! This will be an evening of music and celebration. If you can contribute to the casual buffet of finger food, please get in touch. ← 12 Years of U.S. Crimes in Afghanistan! : We Say No More!